One of the finest shrubs you can grow for spectacular Winter colour of both leaves and red berries, this should be in everyone's winter garden. Hardy and tough as old boots, it has a bamboo-like habit, with several upright stems from a clump. Spring and summer foliage is mid-green with the odd reddish or purplish tinge on new shoots. It produces small white flowers, but it really comes to life as the temperatures drop in Autumn. The leaves turn spectacular bonfire orange red, perfect for Halloween and Autumn colour, and keep getting darker red as it gets colder. The flowers have turned to berries, which themselves get redder and redder too, so they are a frenzy of colour in full Winter. Great as a specimen in a pot, so you can move it near the door to lift your spirits on dark days, or equally at home in the soil in a mixed border planting. Supplied in a 7.5L pot, ready to plant out all year, approx 50-60cm tall in full leaf. Nandina doen't like being planted too deeply. 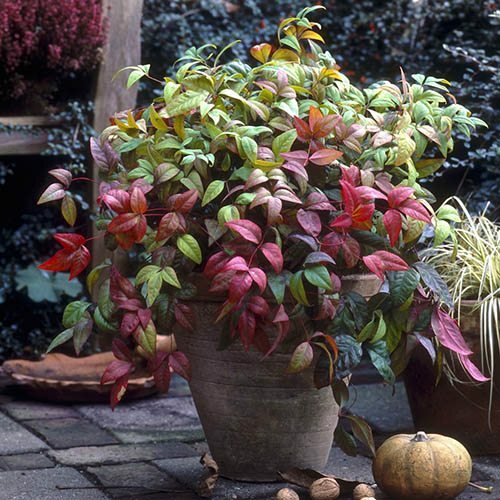 When planting, the top roots of the Nandina should barley be in the soil.